The biggest upset in the polls across Beds, Herts and Bucks was in Bedfordshire where the Labour Party lost control of Luton Borough Council. Labour lost 13 seats, taking 23 to the Lib Dems' 20 - a gain of 11. With the Conservatives winning four seats and success for one Independent, the result leaves no party with overall control at the unitary authority. In Bedford there was one gain for the Better Bedford Party in Sharnbrook, and Tory defector Margaret Davey was elected as a Better Bedford councillor for Castle ward. This will be seen as progress for the party which provided the town with its first elected mayor. There were also two gains for the Liberal Democrats. There was no change in South Bedfordshire with the Conservatives retaining control. In Mid Beds the leader of the Labour group, Paul Griffiths, lost his seat and the Conservatives retained control. In Hertfordshire the main story of the election was victory for the Liberal Democrats in Watford. That success will be seen as an endorsement of the record of the directly elected Mayor Dorothy Thornhill who has been in power for the last year. The gains were made from Labour in five wards and the Conservatives in one. The Greens also won a seat in the town. 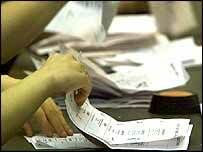 In St Albans there were problems with the electronic voting experiment and at one point it looked as though the vote would be declared null and void. But the count eventually went ahead and the council remains with no party in overall control. Labour retained control of Stevenage and the Lib Dems in Three Rivers. The Conservatives held on to North Herts, Welwyn Hatfield, East Herts, Hertsmere and Broxbourne but they lost one seat to the BNP candidate there. The Liberal Democrats keep their control of the unitary authority in Milton Keynes. The Conservatives held on to the safe council of South Buckinghamshire. Voters were still waiting for results in Chiltern and Wycombe because of recounts. The count in Aylesbury was not taking place on Friday with the result expected around lunchtime.